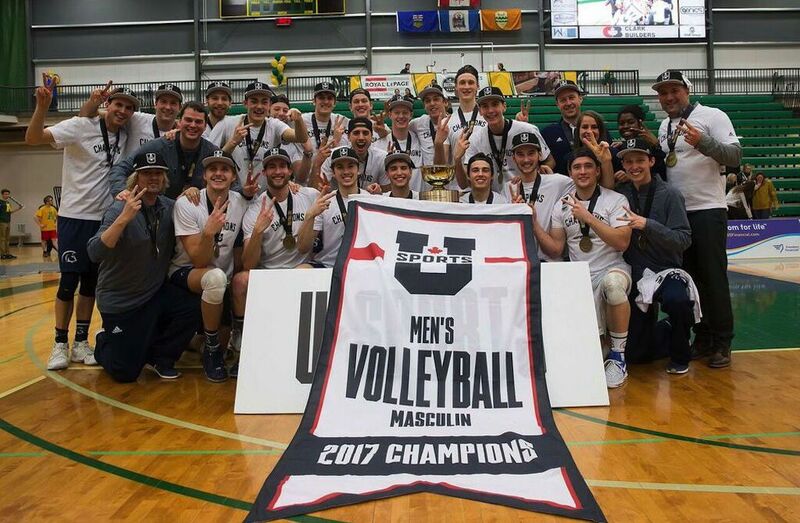 EDMONTON (U SPORTS) – The Trinity Western Spartans captured their second straight U SPORTS Men’s Volleyball Championship, defeating the host Alberta Golden Bears 3-1 (25-20, 25-20, 27-29, 25-23), Sunday night at the Saville Community Sports Centre. 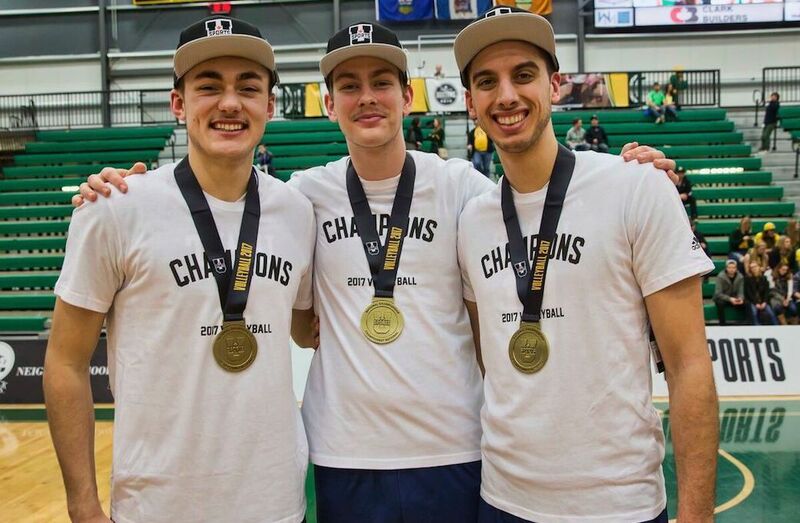 The 2017 U SPORTS FOG Men’s Volleyball Championship win by Trinity Western gives their men’s volleyball program five Tantramar Trophies in their history. This is also the second time the Spartans have won back-to-back national titles, with the others coming in 2011 and 2012. “Whenever we play the Bears at this time of the season, it always turns into one of these classics. Two really great volleyball teams putting on a show, just really great volleyball,” said an emotional Ben Josephson, head coach of the Spartans. “I’m just so proud of our kids for dealing with that environment, we have these great leaders on our team that pushed through. Fifth-year Spartan, and 2017 U SPORTS Men’s Volleyball Player of the Year Ryan Sclater finished his career with a 12-kill performance, adding eight digs and five block assists. Fourth-year Spartan Blake Scheerhoorn finished with a game-high 22 kills on 43 attempts, committing only three attacking errors, earning the Player of the Match. Spartan setter Adam Schriemer led the Spartans offence with 48 assists on Sunday, earning the 2017 U SPORTS FOG Men’s Volleyball Championship MVP. Fifth-year middle Taylor Arnett led Alberta with 16 kills in his final U SPORTS game, adding two total blocks. Fellow graduating student-athlete Brett Walsh also chipped in 48 assists, eight digs and an ace. Scheerhoorn was unstoppable in the opening set, going a perfect 7-for-7 with his attacks, leading Trinity Western to a 25-20 opening-set win. What is normally the greatest part of the Bears team, their middle blocking, worked against them in Sunday’s final. The Spartans stuffed Alberta three times in the opening-set win, and 15 times in the match. The second set was one dominated by Scalter, as well as the Spartans’ tremendous pressure generated off their serve. Sclater found the floor with five kills on just nine attempts, while adding one of the five Spartans’ aces. In a set that saw eight ties and three lead changes, the Spartans were better late, taking the second by the same score. Alberta got to within one set of their Canada West foe, winning one of the best sets of volleyball this season, 29-27 in the third. The Golden Bears also had to fight off two championship points in the set, thanks to a pair of massive kills from Arnett. Alberta’s peak, however, wasn’t high enough, as the Spartans captured the championship with another epic set win, 25-23 in the fourth. With the set tied at 21, a kill by Aaron Boettcher, coupled by three attack errors by the Bears gave Trinity Western the match. Boettcher also earned the championship-winning point, blocking Arnett in the middle.